1 Ounce Platinum Maple Leaf Bullion Coin 999.5 Fine. The Platinum Maple Leaf is produced by the Royal Canadian Mint. Until 2009 the coin was available in fractional sizes in addition to the 1 ounce size. 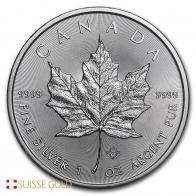 However, in 2009 the Royal Canadian Mint stopped production of the fractional platinum Maples. Currently, they are only available in the one ounce size. The front of the coin features an image of Queen Elizabeth II with the year of minting and the coin's face value on the front. 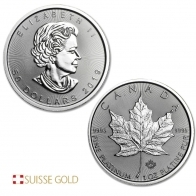 The Platinum 1 ounce Maple Leaf has a face value of $50 CAD. The reverse of the coin feature an image of the iconic Canadian Maple Leaf coin with the coin's fineness and weight. 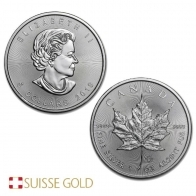 The Royal Canadian Mint produces the Canadian Maple Leaf series in gold, silver, platinum and palladium in 1 ounce sizes. The Canadian Maple Leaf series is the most popular series produced by the Royal Canadian Mint. In addition to the Canadian Maple Leaf, American Eagles and Perth Mint Platypus coins are also both available in platinum in one ounce sizes. The Austrian Mint has also recently launched a platinum philharmonic coin. 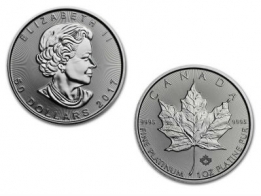 The platinum Maple Leaf coin has one of the lowest premiums available for a platinum coin in the precious metals market. They are also the most popular platinum coin among individuals buying platinum coins, and well recognised worldwide.